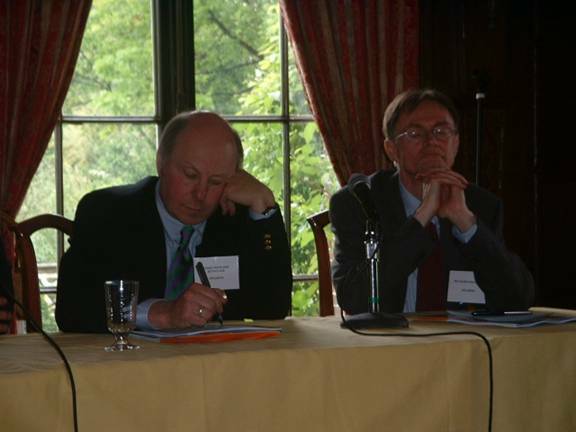 July 18th 2006, 1:36 [PST] – New York – The New York Institute of Technology (NYIT) held Long Island’s first Peak Oil conference on May 15, 2006, titled “TEETERING ON THE BRINK,”1 where Energy Investment Banker Matthew Simmons, Professor Richard Heinberg, and author James Howard Kunstler were all scheduled to speak. Unfortunately Matt Simmons’ father passed away just a few days before the event so he was unable to attend. FTW sends our condolences to Simmons and his family. But fortunately, Richard Heinberg was able to modify his presentation to include the most important aspects of Peak that Simmons would have otherwise covered. Joining these Peak Oil experts on the panel were energy industry professionals from the local area including John Hritcko, Jr., Regional Director of Shell Group, Broadwater, which is the Liquefied Natural Gas (LNG) facility proposed for the Long Island Sound; Cynthia M. Crookes, Project Manager of Florida Power and Light (FPL), who has proposed a 40 turbine off-shore wind farm in Long Island waters; and Elizabeth McCarthy, CFO, Long Island Power Authority (LIPA). The conference was very well organized, incorporating local issues within a global context. My personal experience at this event further demonstrated why I will not be living on Long Island much longer. As one of the audience members pointed out during the Q&A session, the Peak Oil experts and the energy industry professionals were having a “dialogue to the death.” There was no real exchange happening, and the industry professionals never addressed Peak head-on. Perhaps Matt Simmons could have provided a much-needed bridge between the two if present, but I doubt it. When James Kunstler said that there isn’t going to be any meaningful change implemented because the American people don’t want real change, this was virtually identical to John Hritcko of Shell saying that we shouldn’t compare our country to Cuba because most Americans don’t “aspire to live the lifestyle” of a Cuban. From opposite ends of the spectrum they came to the same conclusion. I spoke with Beth Fiteni, a brilliant young woman who works as the Issues Program Director for Neighborhood Network, a local non-profit environmental group. When I told her why I am not a supporter of Big Renewables, such as the wind farm proposed by FPL off the south shore of Long Island, she lectured me on how my voice will not be heard if I take such a rigid stance. I tried to explain why I support small cooperative energy systems almost exclusively, and she didn’t disagree. But her experience has shown her that Long Islanders won’t listen to my approach. She is probably right. Cynthia Crookes of FPL Energy stated that wind farms are a part of the solution for climate change, and that off-shore is the only place for them on Long Island since we don’t have the available land needed to install wind turbines inland. I questioned both of these assumptions during Q&A. First, I pointed out that a study by scientist David Keith shows if too many wind turbines are installed across the globe this will change global wind patterns and contribute to climate change. Then I noted that inland wind could be implemented on Long Island in small cooperative settings by using smaller turbines, so why isn’t this being encouraged by LIPA? Crookes said that small cooperatives have been implemented elsewhere, but we are not seeing them here on Long Island. (Elizabeth McCarthy never addressed my question of why LIPA isn’t encouraging small wind cooperatives). And she is certain if too many big wind turbines were turning across the globe they would contribute to climate change, but that is “way off in the future.” She doubts that FPL’s one project of 40 wind turbines is going to cause climate change. It should be noted that in December of 2005, FPL bought Constellation Energy Group for $11 billion to create the largest utility in the country called Constellation Energy. However, this merger is currently held up in the Maryland court system. FTW will address this issue in the near future once the courts make their final ruling. The privatization of utilities is a frightening trend that FTW addressed back in January when we published a critical report titled THE END of the GRID. John Hritcko of Shell lost all credibility in my eyes when he answered a question about Peak Oil by quoting Daniel Yergin. Hritcko said we shouldn’t be talking about Peak directly, but what we can do to meet rising energy demand. He admitted LNG is ultimately unsustainable long-term, but that there is plenty of natural gas around the world to keep LNG competitive for a long time. His main concern is competition: Will coal and nuclear end up out-pricing his LNG facility? This is all a part of the problem, not the solution. Both Hritcko and McCarthy were strongly questioned by Professor Scott Carlin of CW Post who dared them to speak directly to Peak. Hritcko said little more than that we shouldn’t get fixated on the date of Peak, but rather focus on “alternatives” for meeting demand. His preferred “alternatives” are LNG and piped natural gas. “What is LIPA’s blackout forecast?” demanded Carlin after LIPA’s McCarthy effectively refused to speak directly to Peak. McCarthy responded by saying that there is plenty of energy coming online to meet demand up until 2015. Great. No need to worry until 2015! I feel better. Don’t you? Long Island’s demand for energy grows by 150 Megawatts (MW) per year. LIPA’s only true concern is to ensure they can fill that demand. No one is interested in addressing the fact that the problem is increasing demand: the problem is over-consumption. When I raised precisely this fact during Q&A it was entirely ignored, as if I hadn’t said it at all. Those who are in a position of power and authority, or those seeking such a position, do not want to give any consideration to slowing down, stopping, reversing, or changing the paradigm of economic growth. Some individual citizens of Long Island recognize that this is what is needed, but my experience is that they are merely paying lip service to the truth with no intent or desire to implement a real Powerdown strategy in their community or in their own life. Long Island has so many resources it could certainly deal with Peak very well if sound thinking prevailed. Even I have many ideas for municipalities and public space here on the Island as energy (and inevitably food) prices skyrocket, but I worry that any effort to implement even a single concept would be wasting valuable time that could produce real results in other endeavors. This is what Richard Heinberg and I discussed during lunch. Heinberg is now promoting “The Oil Depletion Protocols,” which is the title of his upcoming book that outlines a plan for nations to start decreasing the amount of oil they produce and consume. Where I have doubts about trying to influence public policy, Heinberg has now fully dedicated his efforts to just such an endeavor. “But what about the lifeboats?” I asked as we waited on a buffet lunch line. “If there is a global oil war, I think the lifeboats are our only hope!” I responded. “You might be right,” said Heinberg. The term “lifeboats” is the name given by Heinberg to the Intentional Community and Eco-Village movements, where sustainable living practices for food, water, energy, and transportation are being developed and implemented. In Heinberg’s view, a global oil war must be avoided at all cost, and the best protocol he knows of to make such an attempt is what he is promoting in his new book. I mentioned to him that this effort may ultimately be futile, and he is well aware of that, but this is the path he has chosen for himself and his legacy. FTW has determined that the likelihood of getting The Powers That Be to stop dead in their tracks on the road to destruction and do an about face is close to zero, so we are not taking the path Heinberg has embarked on. But if there is a man alive on the planet today who possesses the knowledge, wisdom, understanding, composition, and ability to lead such a miraculous effort then that man is Richard Heinberg. We send our prayers to his efforts and wish him (and the entire human race!) the best of luck; it will be needed. In Simmons’ absence, Heinberg inherited the position of keynote speaker, and he was flawless. There is just something about the way he handles the material, losing none of the profound impact that the subject matter demands while maintaining a vocal composition of peace and tranquility. His personal presentations are matched in completeness only by his written works such as The Party’s Over and Powerdown. Throughout the day Heinberg’s presentation was repeatedly referenced by both panelists and participants as “depressing.” I could only choke back laughter and wonder what everyone was going to think of James Howard Kunslter’s blunt, pessimistic, sarcastic, unapologetic and at times even crude presentation. Before Kunstler was up to bat, John Hritcko spoke on the growing LNG industry. He never mentioned the very unpopular Broadwater LNG project planned for the Long Island Sound that he is heading for Shell – the largest player in the LNG market today. Hritcko danced around the issue of Peak saying that Shell doesn’t necessarily disagree with the information Heinberg had just presented. His presentation was filled with charts showing that worldwide gas supplies should be adequate to meet growing demand well into the future as well as growth projections for the LNG market. Kunstler’s presentation – as always – focused on the psychological dysfunction of American culture. He spent a good amount of his time degrading corporate executives who point to graphs and diagrams as if they hold any significance to what we are really talking about. He said this gives people the illusive feeling that they are in control of an out-of- control situation. It did not go unnoticed that this was precisely what Hritcko, a corporate executive with Shell, had just finished doing. During his presentation Kunstler repeatedly stated that there isn’t going to be a hydrogen economy, at least not one of any significant size as we are being told by the likes of Jeremy Rifkin and others. Kunstler is correct. Even former Director of Central Intelligence, James Woolsey, agrees with him on this point! Kunstler also continually tongue-lashed students and young entrepreneurs who insist that technology will solve our energy problems. “Technology is not energy,” demanded Kunstler. Immediately following Kunstler’s presentation, David G. Schieren, Chairman and CEO of EmPower LLC., a local alternative energy firm and conference sponsor, took to the podium to moderate the Q&A session. Schieren, who has just graduated from NYIT with a Masters degree, looked Kunstler dead in his eyes and ensured him – and the entire audience – that hydrogen does have a bright future. I will not be living on Long Island for much longer. 1 Visit http://www.energyshock.org for more information on TEETERING ON THE BRINK. It appears this may be an annual or ongoing series.